Cardiff (Caerdydd) is the capital of Wales. A city of approximately 850,000, it is going through quite a renaissance and is visited by over 18 million people annually. The city is billed as a “city of arcades”, and at this time of the year all of those arcades are in full Christmas glory. Walking in the centre of town, we went from arcade to arcade filled with unusual and tempting stores. The decorations definitely lightened the gloom of the gray rainy skies. 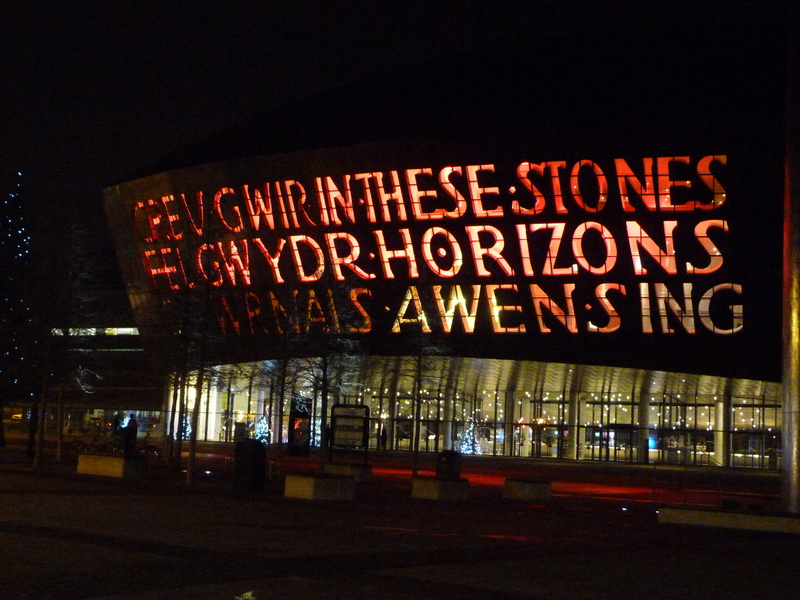 By the time we headed to Cardiff Bay it was getting dark, as it does at 4:00 in November. Before the Second World War, Cardiff was the biggest coal port in the world. But of course its importance as an industrial centre made it a prime target during the war. 2100 bombs fell on Cardiff and decimated the port and many civilian areas of the city. The bay has undergone massive renovation in the last few years. The focal point is the new Millennium Arts Centre, a startling and massive arts complex dedicated to theatre, dance, opera and music. There was nothing on that we particularly wanted to see that day, although we were very tempted by Deffro’r Gwanwyn, the Welsh version of Spring Awakening. But it was amazing just to see the building, especially lit up in the dark of the night. While walking among the shops and pubs by the bay, a lovely young Welsh woman came over to offer us freshly baked Welsh cakes, made down the street at “Fabulous Welshcakes” Now, I have made Welsh cakes every March 1st (St. David’s Day) for the last 28 years but I have never had them “in situ” so to speak. So I was thrilled. She invited us back to the store for more cakes and “Bubbly” – Welsh cakes and bubbly!! Who could refuse that? For those who haven’t had a Welsh cake, it is a kind of tea cake, with currents, cooked on a griddle and always best fresh. I had tried some earlier in the day from a bakery at the market, but they were several hours old and by Tim’s estimation not as good as mine. These fresh ones, however, were very good and of course went beautifully with the bubbly. I am fairly proprietorial about my Welsh cake recipe, but I will give it to you as long as you promise to make them to share! Warmed by cake and bubbly, we worked our way to a much less touristy part of town, Canton, where we ensconced ourselves at the “Chapter Arts Centre”. This fabulous arts complex was started almost 40 years ago, when a group of artists purchased an old school from the city. It is a thriving arts community with 3 theatres, 2 cinemas, a gallery, studios, 2 bars, a cafe, over 60 cultural workspaces. The night we went it was filled with people and was clearly an exciting place for artists from all disciplines to meet and work together. We saw “Resistance”, a movie set in Wales during the Second World War. It is posited on the idea that Germany has invaded Wales and all of the men from one village have disappeared underground. It is a story about how the women cope, and don’t cope, with the invasion. A good story and a great vision of the Welsh countryside, if you have a chance to see it. You might want to make a plate of Welsh cakes to eat while you watch. 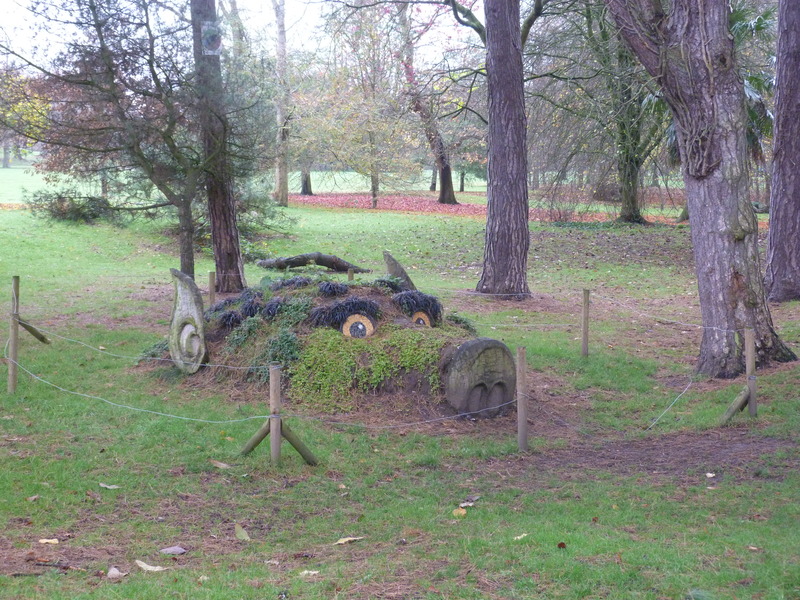 A creature in Bute Park, on the way to the museum. The next day we walked through the park to the National Museum where we began to understand the history of Wales as a series of constant invasions. Roman, Norman, English – it is a country always under siege of one kind of another. One of the reasons we wanted to stop in Cardiff was to go to the Royal Welsh College of Music and Drama. Students from the Masters in Musical Theatre program were doing a production of “Merrily We Roll Along”, a musical by Stephen Sondheim that we love, but have never seen. “Merrily” is famous for closing after a 2 week run on Broadway in 1981. Kind of a cult classic amongst those who know it, Sondheim has been re-working it and we were interested to see it live. The RWCMD is housed in a brand new, huge, arts complex beside the park in the centre of town. We arrived early so that we could sit in the café with a glass of wine and listen to some jazz. Students from the music department were performing as part of their course work, and we were treated to standards, bee-bop and contemporary jazz as 6 different student groups performed. Great to be reminded of just how hard jazz is, and to see these young students keeping it alive. “Merrily” was great. The students were very accomplished and passionate about their work. It is a school I would definitely recommend to anyone considering a career in musical theatre. And it was great to see how “Merrily” actually works. We both cried through “Not a Day Goes By” . If you don’t know it, you can listen to Bernadette Peters singing it. We devoted our last morning to the castle in the centre of town. 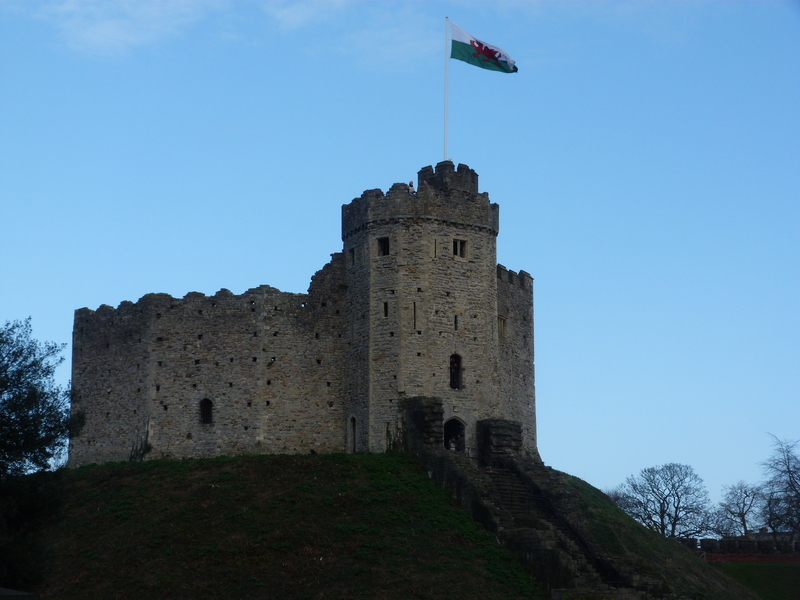 Cardiff Castle dominates the city and its history. Fortifications were built here by the Romans in 55 AD, the Normans in 1081, and subsequent English builders continued to make it a defensive barricade to protect their interests and keep out the rebellious Welsh. 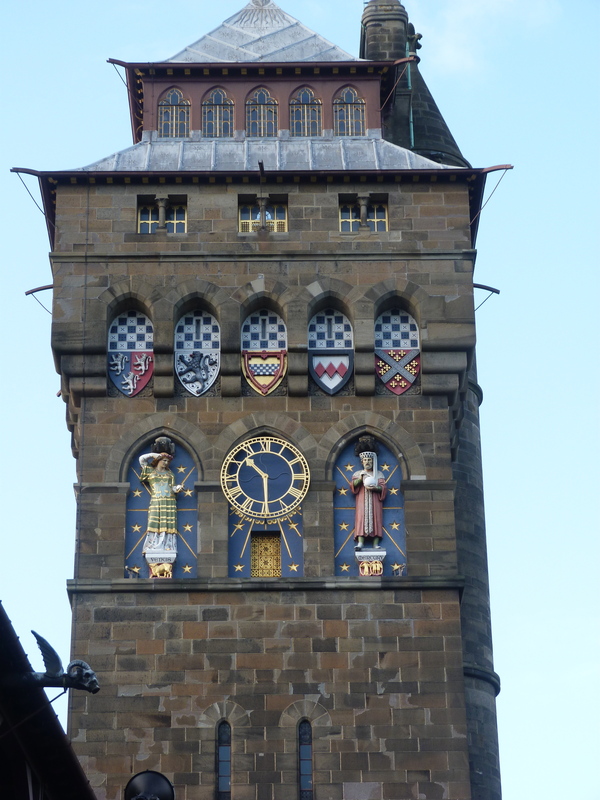 In the 19th century the 2ndMarquess of Bute turned it into a Victorian extravaganza. Bute is said to be the “father of modern Cardiff”, building docks and railways to export Welsh coal. He amassed a huge fortune on the backs of the Welsh coal miners and set about building a lavish castle. Working with the designer “Capability” Brown, he had the grounds of the Norman/Roman fort excavated and re-built, creating gardens and vistas for his castle. The banqueting area is still in occasional use by the Royals (and apparently can be rented by mere mortals for £500 per hour). 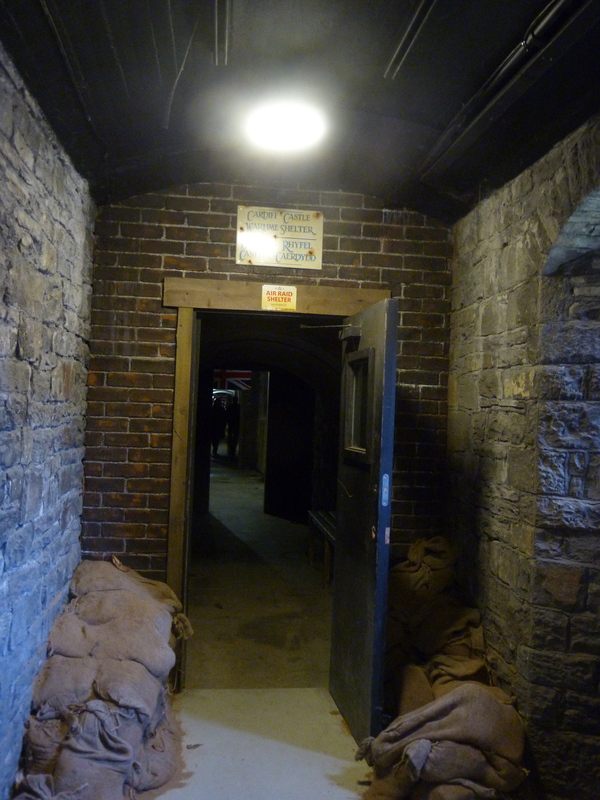 During the war, the Bute family built air raid shelters under the embankments. It was the safest shelter in the city and housed 1800 people during the raids. 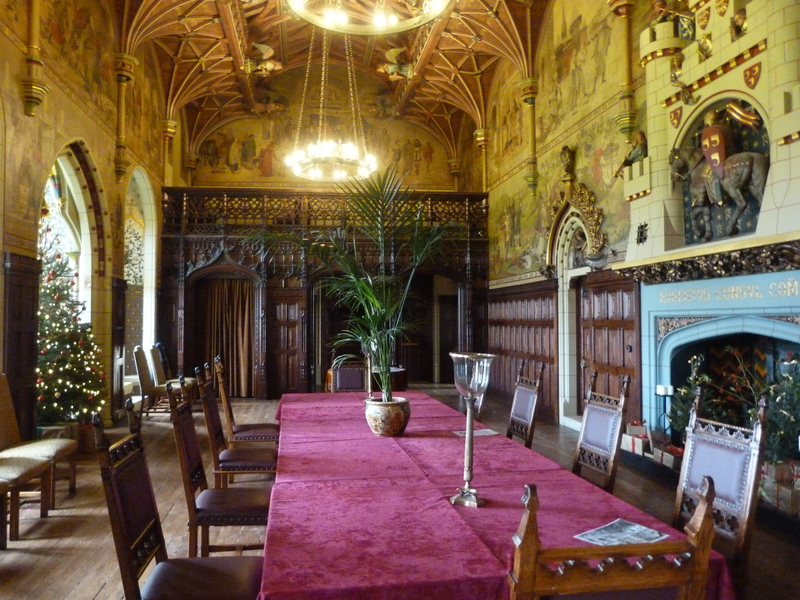 In 1947, the Bute family gave the castle to the people of Wales. It only took 2000 years. 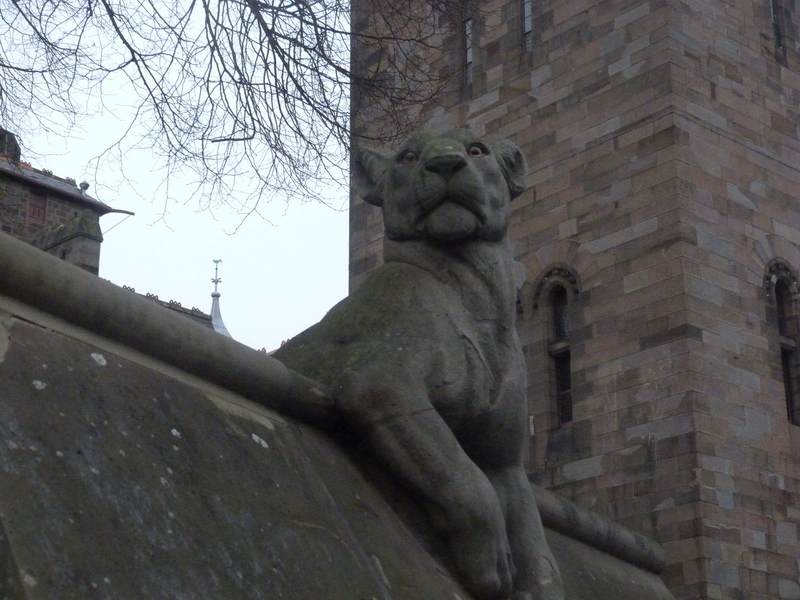 Lion: one of the animal sculptures on the castle wall. With the name “Wynne-Jones”, you know that Tim’s family is Welsh. His father was born in Wales, and going there was an important part of this trip. We also wanted to walk on whatever coastline we could get to. 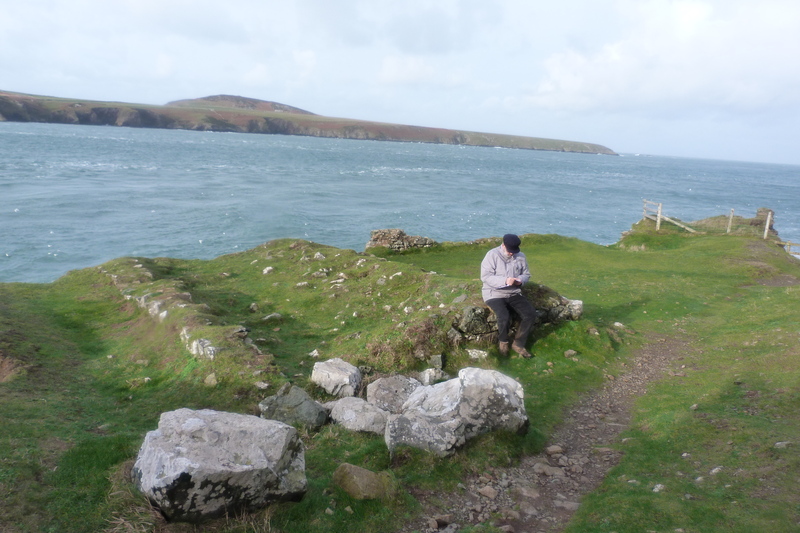 So we headed out to discover what we could of the Pembrokeshire Coastal Path. 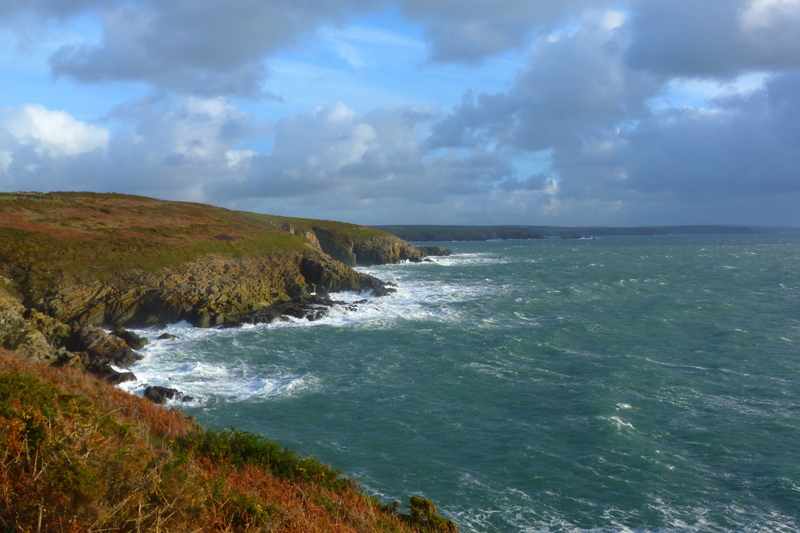 The Pembrokeshire Coastal Path comprises 186 miles of south west Welsh coastline. It is remote and, in November, isolated. We decided to base ourselves in the city of St. David’s (Tyddewi) in case the weather turned bad and we had to just curl up with our books instead of walking. Late November is very much the off-season and we weren’t sure what to expect. 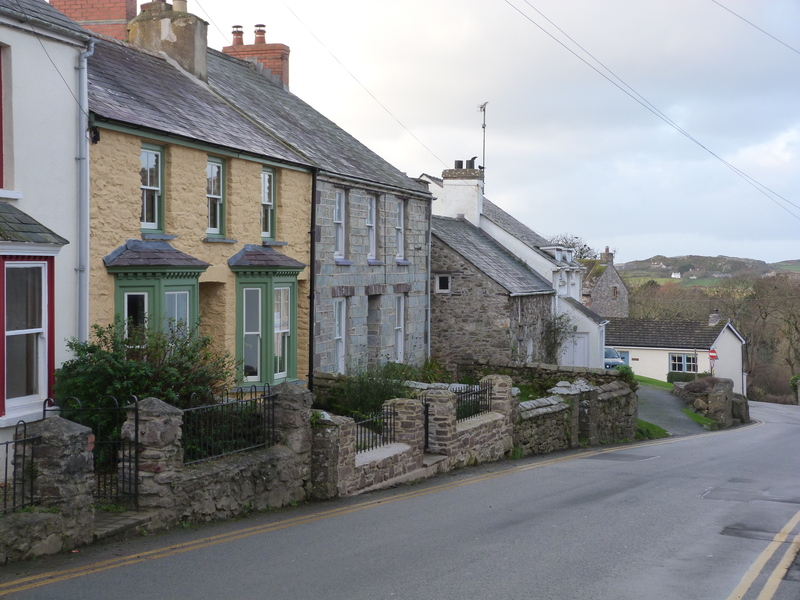 St. David’s is the UK’s smallest city. With a population of 1,800, it seems miniature in all respects. Tiny cottages nestle together on two main streets, and you can circumnavigate the whole city in about 10 minutes of walking. St. David himself established a monastery here in 589 AD, and it has been a place of worship ever since. The city status is due to its large and impressive cathedral. 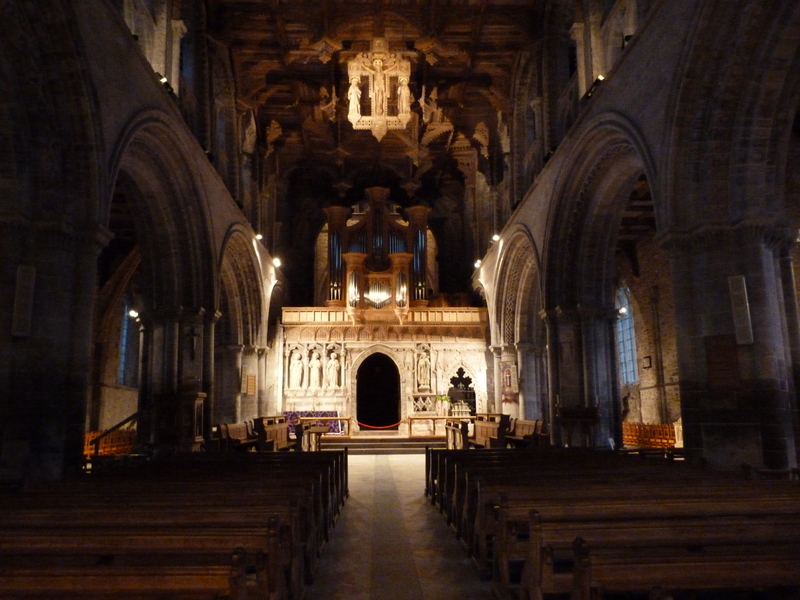 St. David’s Cathedral was begun around 1180 AD. An extraordinary feat of workmanship, the cathedral has beautifully carved and painted ceilings, tile floors, mosaics, sculptures and tombs throughout. 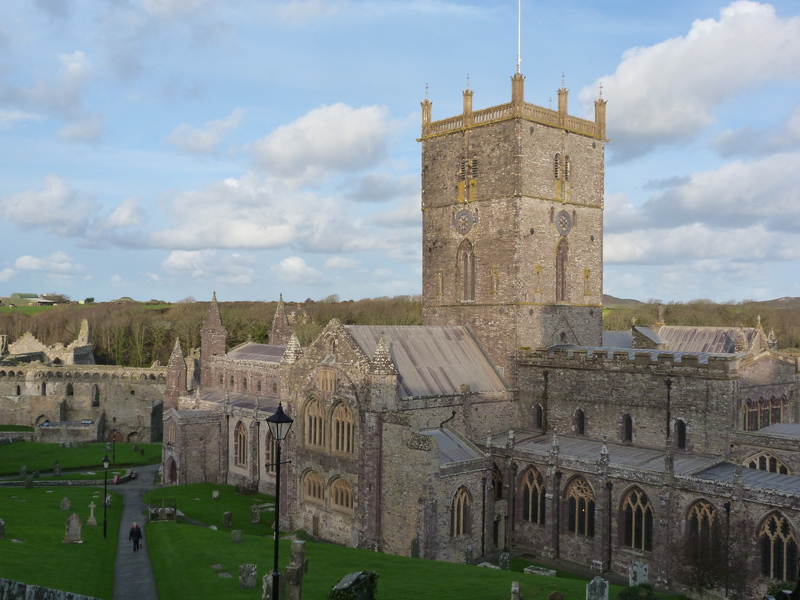 In the 14th century, Bishop Gower secured the importance of St. David’s when he appealed to the Pope to agree that two visits to St. David’s equals one to Rome. This means that pilgrims can be as blessed by visiting St. David’s twice in their lifetime as they would be by visiting Rome once. “This pilgrimage and the wealth that pilgrims brought though their gifts granted the bishops of St. David’s enormous power and wealth” (from the Treasure exhibit, in the Cathedral) The wealth of the cathedral is evident. Pilgrims, and tourists, have kept the Cathedral alive, and it is very much at the centre of the tiny city’s life. But our days were spent appreciating a much older and more rugged beauty. Wales is a land of mystery and legend, and the Coastal Path, with 58 beaches and 14 harbours, has many stories to tell. We began our first slightly rainy day with a visit to the superb tourist information centre. 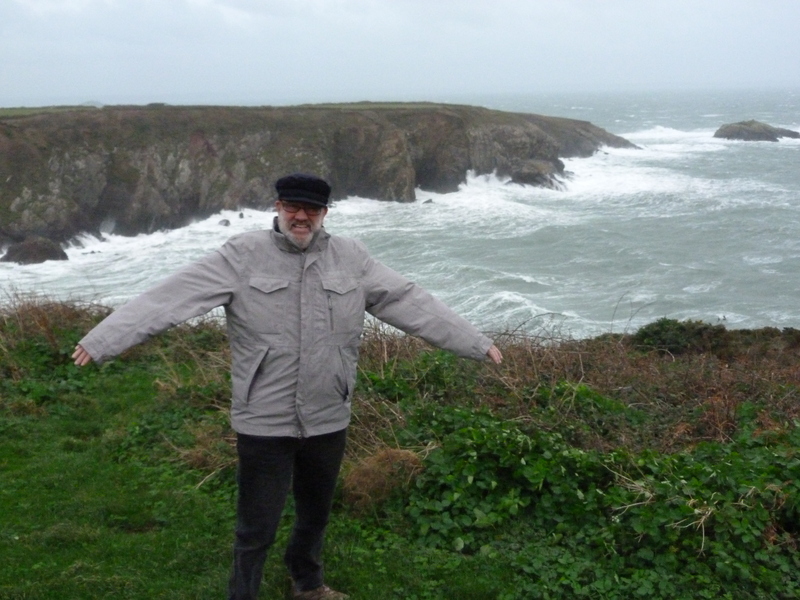 We picked up the path about ½ mile from the centre and found ourselves overlooking Caerfai Bay. 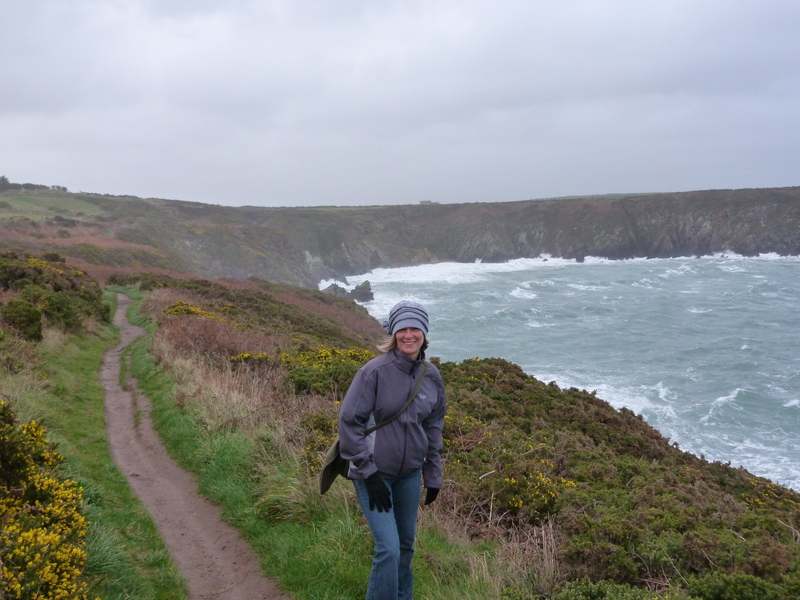 The wind was fierce, but not cold, invigorating, not overwhelming as we set off along the edge of the cliffs. The walk took us to the most westerly chapel in Wales, St. Non’s. St Non was St. David’s mother and a nearby fresh water spring, credited with many miracles, is said to have sprung up at the moment when St. David was born. The present day St. Non’s chapel was constructed from stones of the old chapel, built around 1300. A tiny refuge, we were surprised to find lit candles and offerings to the Saint with not a soul in site. 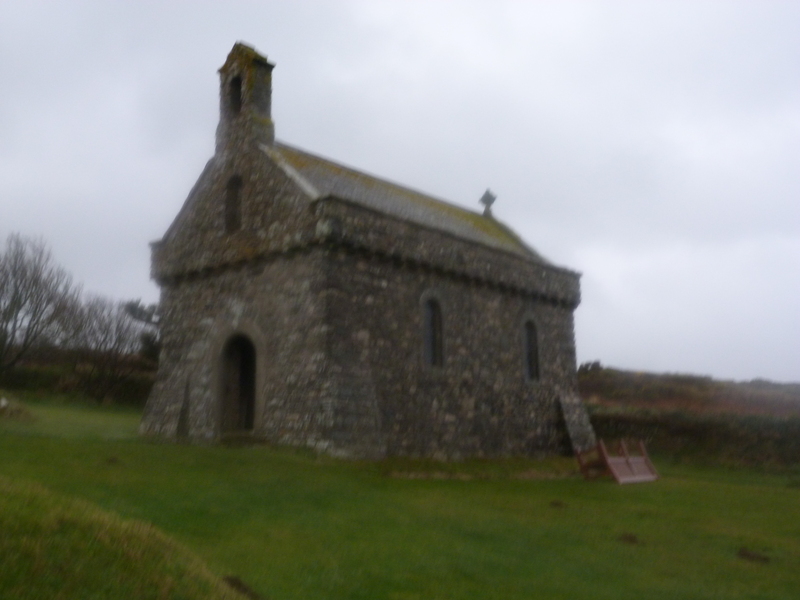 The chapel at St. Non’s isn’t used for regular service in the winter because the rains come through the 2 ½’ thick walls, despite the waterproofing. Coming out of the chapel, the rain hit us sideways from the sea and we didn’t have much on in the way of waterproofing. So we decided to abandon the path and head back to St. David’s. We were drenched when we walked into the Farmer’s Arms, but after a bowl of leek and potato soup and a pint of Double Dragon we were dry, and so was the weather. 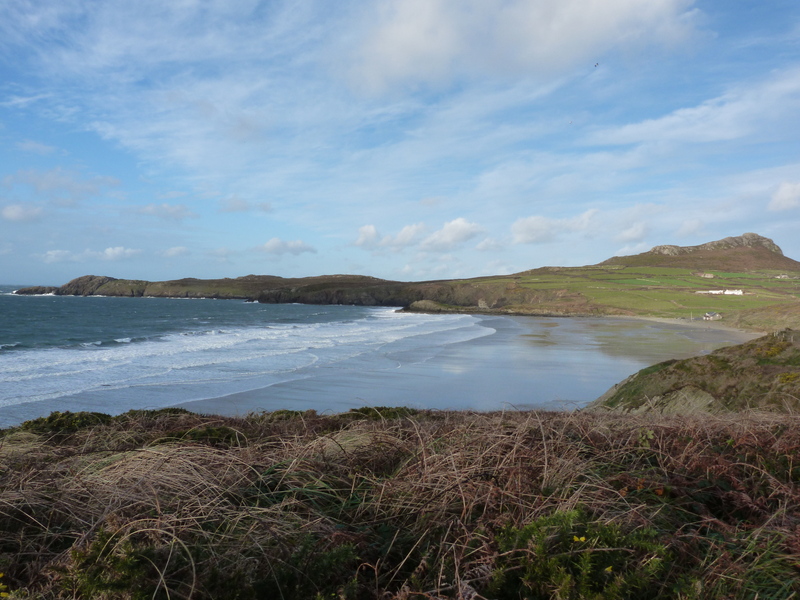 A bit of sun came out so we headed out of town again, about 3 miles out, to join up the path at Whitesands Bay. Whitesands is breathtaking. 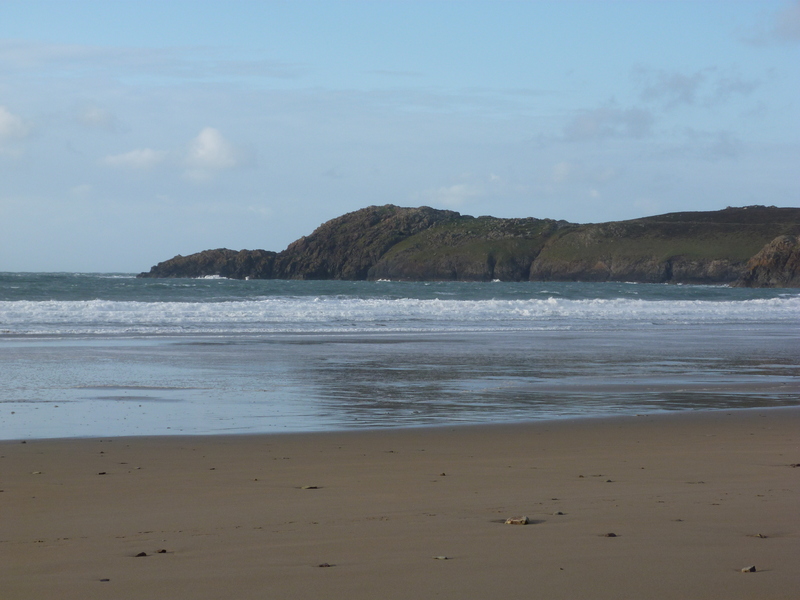 Tradition has it that St. Patrick left from Whitesands on his mission to Ireland in 430 AD. A long, pristine white beach with huge crashing waves, bordered by hard edge cliffs, we had the place to ourselves. We worked our way back to the path, skirting the edge of the cliffs. The views are unbelievable. It is the kind of place where people go to extremes to get good photos – apparently a prominent photographer was swept to his death by the fierce winds while trying to capture a perfect shot. 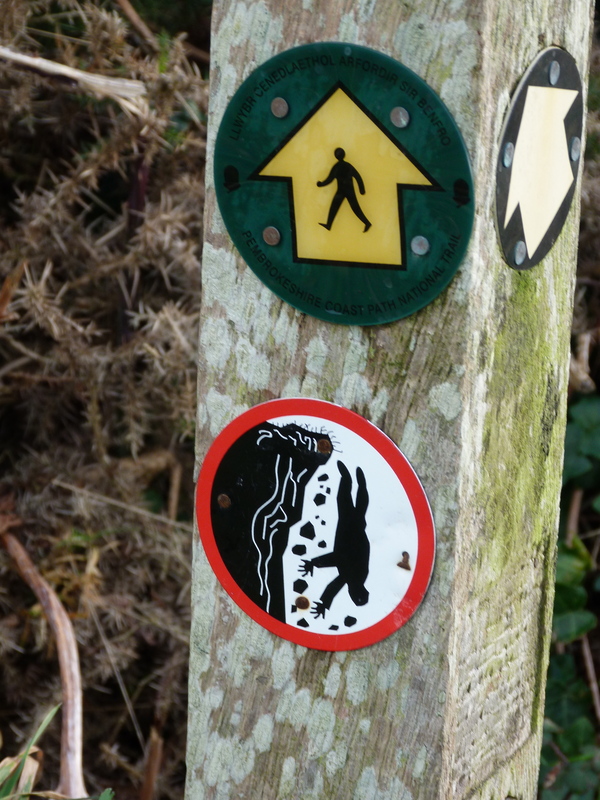 Signs remind us: “Cliffs kill! Keep to the path”. We did. We walked as far as St. Justinian’s where there is a lifeboat station, built in 1869, tucked into the inlet. 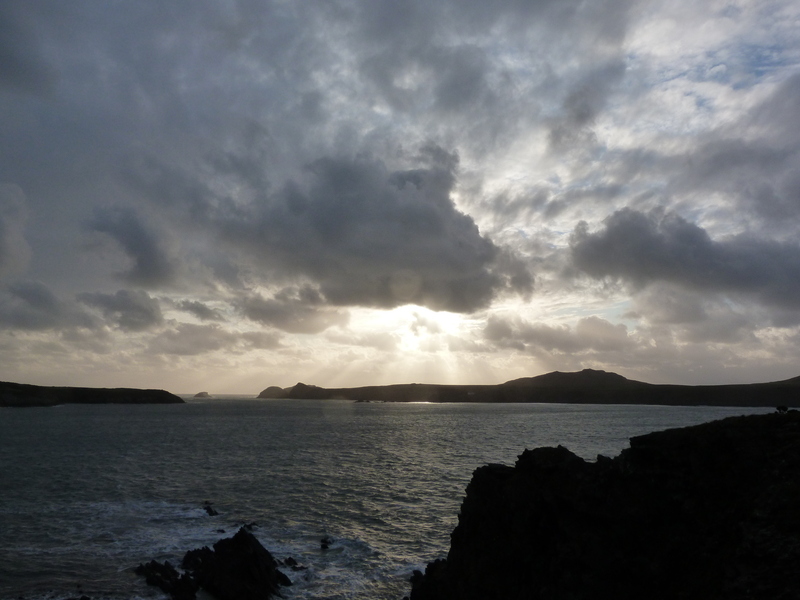 St. Justinian was St. David’s friend, a strict ascetic who lived on Ramsey Island. Legend has it that his disciples beheaded him (he was apparently a bit too strict! ), but he picked up his head and walked across the water over to the mainland to die, where a chapel was built in his name. Light fades quickly on these short winter’s days and we didn’t want to be on the cliffs at night. So we headed overland back to St. David’s, where even in the off-season we are able to find an excellent Indian restaurant that served a brilliant curried fish dish with coriander, lemon and smoked paprika – Tarkary Basa – like nothing I have ever tasted. The next day dawned sunny and dry, so we picked up the walk at Porth Clais, a harbor featured in the Mabinogion (a famous collection of Welsh legends). It was the landing place of a giant boar, pursued from Ireland by King Arthur. More recently (18th century) it was an important trading quay with lime kilns in active use until the beginning of the 20th century. It is a perfectly hidden, tiny harbour, and from April to October it is the launch for boats and kayaks that head out to Ramsey Sound to see porpoises and seabirds. The waves crashed, the wind blew and a new breathtaking view was around every corner. From Porth Clais we walked to Porth Lisky, a bay filled with red and green pebbles formed from Pre-Cambrian ash and lava. 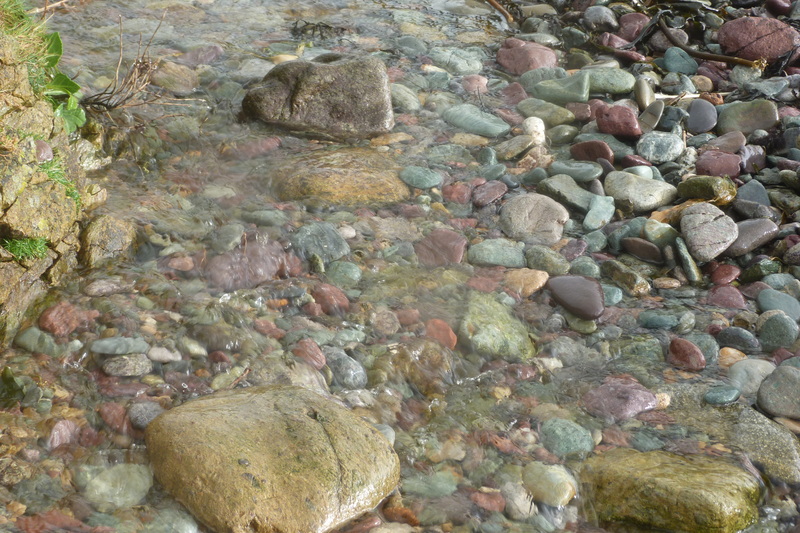 The rocks are beautiful and the colours gleam like jewels as the water flows over them. We were treated to a sun shower, and although wet again, we were delighted by a rainbow overhead. The wind dried us quickly as we proceeded along the coast. 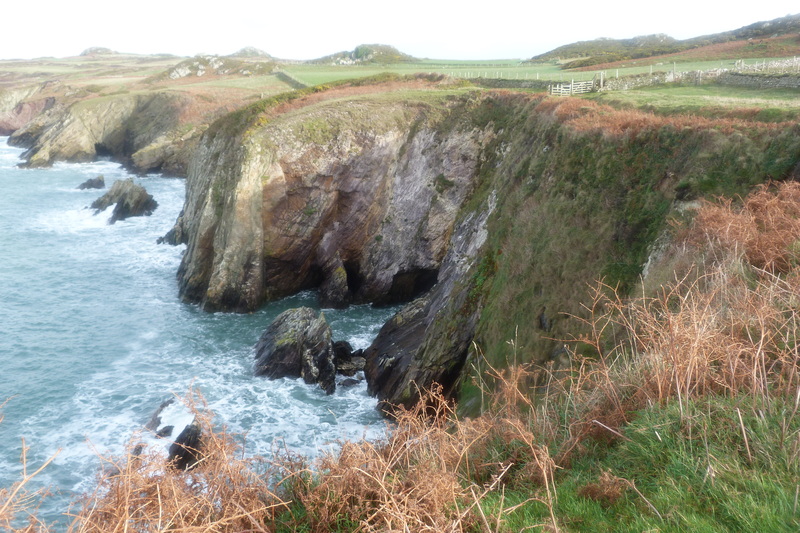 We passed 19th century copper mines, and the sheltered bay of Carn ar Wig, used by ferry boats since the 13th century. But the weather started to turn again, and we decided it was time to turn away from the shore, inland back to St. David’s where a late plowman’s lunch at the Farmer’s Arms awaited. We had met only one person on the path in our two days, Jimmy from Montana, who had devoted the whole month of November to this walk. He was heading to St. David’s with his life on his back (tent, cook stove, sleeping bag, everything). We couldn’t imagine what it is like to camp out in this constant wind! It was Jimmy’s last night before heading back to the States, so we shared a drink together and got advice for our next coastal walk. The day ended with Evensong at the Cathedral. Even as an agnostic, I felt blessed. It never ceases to surprise me that Britain is both large and small at the same time. It’s like a magic box. Some journeys are interminably long and complicated. But then there are times when you can go from London to an entirely different city for lunch, then be back in London in time for cocktail hour. Such was our experience when we were invited to lunch with writers Jill Patton Walsh and John Rowe Townsend in their home in Cambridge. 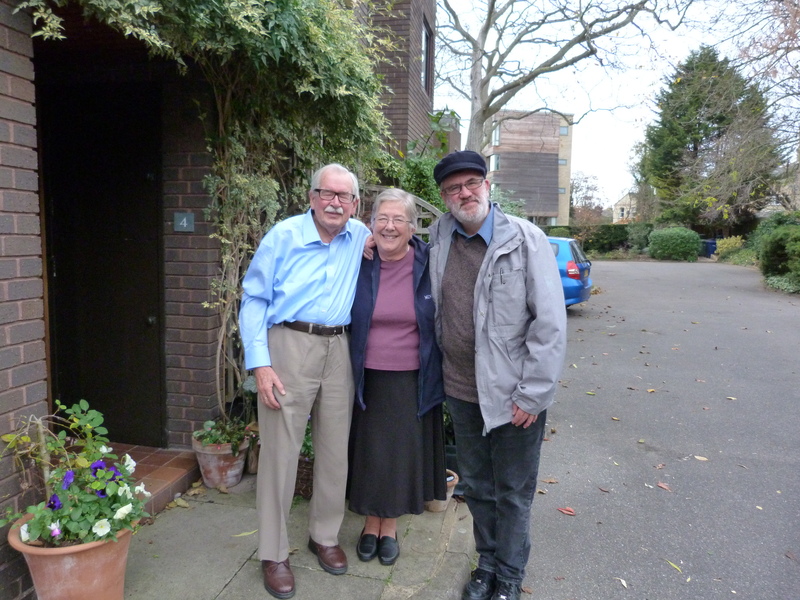 Tim has known Jill and John for years and I was very much looking forward to meeting them and to seeing Cambridge. As a North American who grew up at a time when educational systems were under scrutiny (when I was a teenager I propped “Teaching as a Subversive Activity” by Neil Postman, on my desk as a flag to my decidedly out of date high school teachers), it is hard for me to understand how generations of people in the UK are affected by their university status. 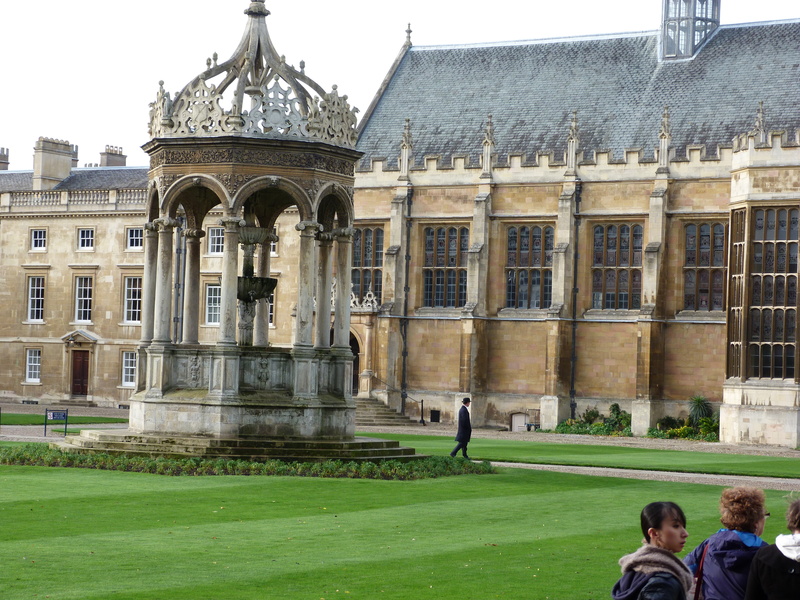 Getting into Oxford or Cambridge is the single most determining factor for the outcome of a life. That’s not to say that all Oxbridge grads are successful or happy. Only that the experience will mark (and some say mar) them for life. 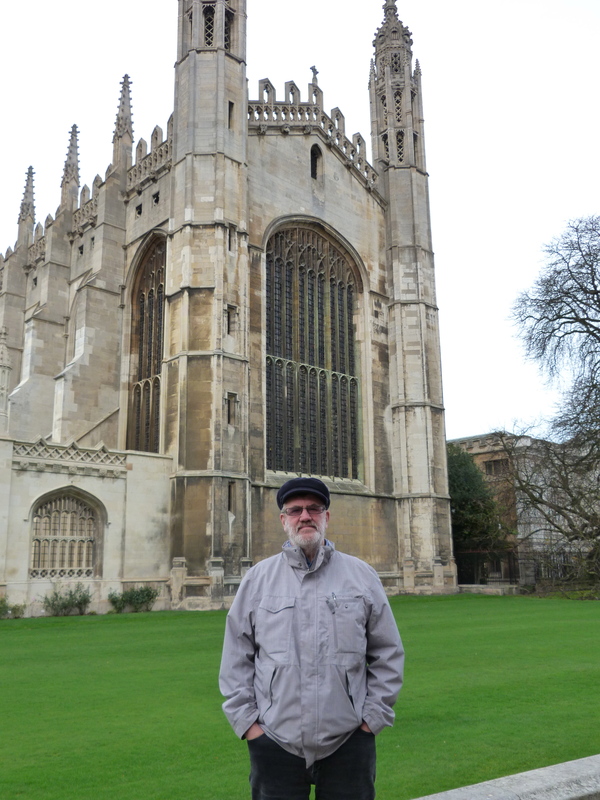 Cambridge is an exquisitely beautiful city with the university at the heart of everything. College after college proudly declares its noble patrons. Inner quads are immaculately kept. 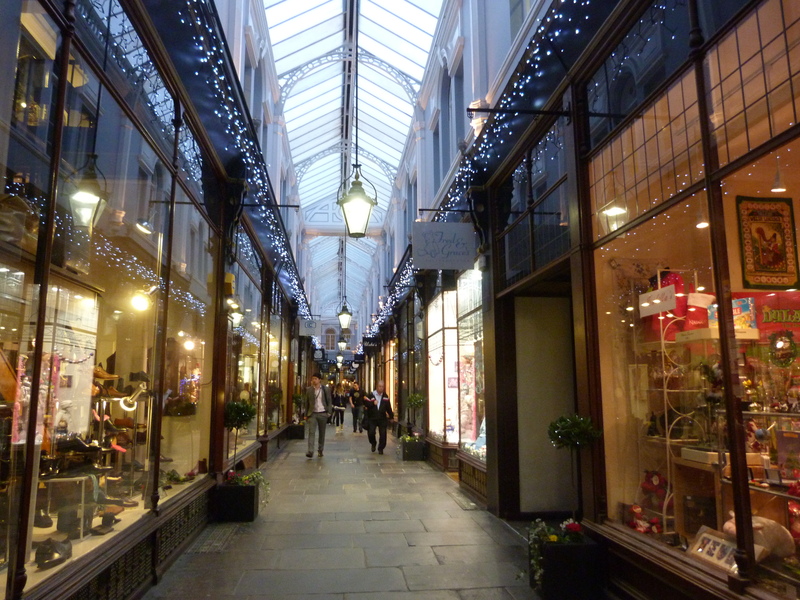 Shops in the city centre are exquisitely tasteful, filled with expensive clothing, jewelry, handcrafted shoes and gifts one imagines visiting parents purchase. History, and privilege is everywhere, as is the craftsmanship that creates these buildings, carvings and ornaments. But there is also a marvelous eccentricity about it all. Walking through a peaceful path in Magdalene College, we came upon a few tiny, tasteful, carved memorials. 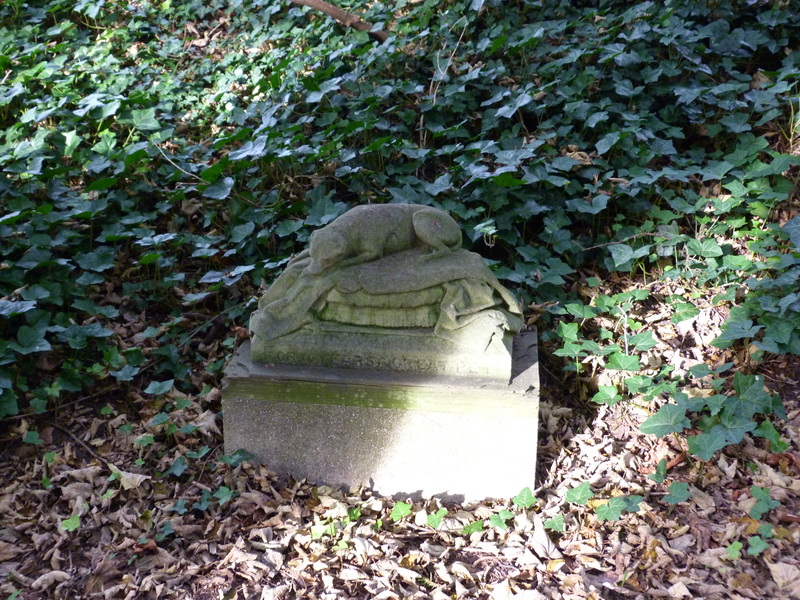 A late 19th century graveyard for beloved pets. 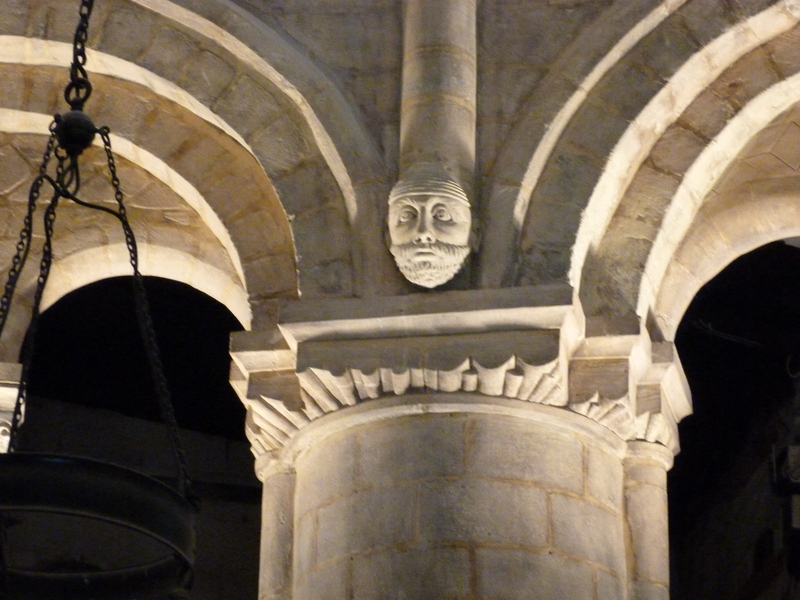 Gargoyles, faces and impressive statues watch you from every angle of every building. The streets are cobbled and cut off to car traffic. 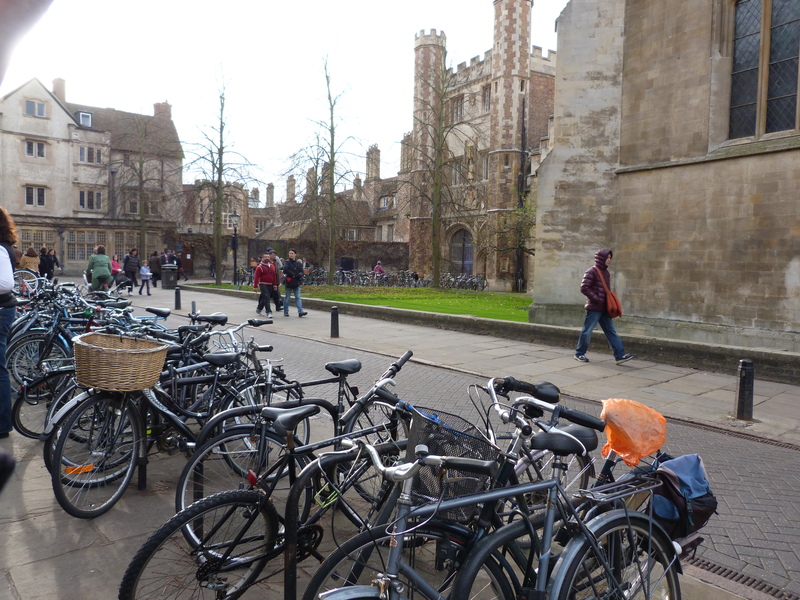 Thousands of bikes are chained up outside of the colleges and students whizz past, scarves identifying their colleges flying in the wind. They rule the road and low betide anyone stepping off the curb. Is it any wonder that these young students feel and behave in an elitist fashion? That the city exudes a rarified atmosphere guaranteed to make us mere mortals envious? It is the epitome of a combination of wealth, intellectualism, beauty and youth. All we could do was to watch it all go by, and feel like somewhat lesser humans. 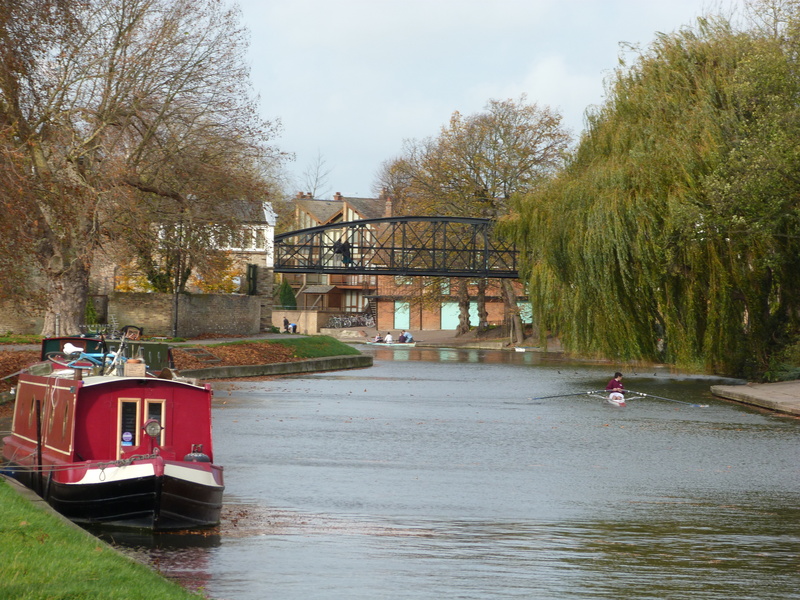 The river Cam. Even in November the rowers and punters were out. But then we went to visit Jill and John, in a house that overlooks the river. They are as marvelous as Tim had led me to believe. It was a fabulous visit that blended politics, children’s literature and food. Salmon with wild rice, followed by a delicious apple tart (When I asked Jill about the apples she replied, “I always use Bambery apples when I can. They are perfect for apple tart”) and local chesses, including a particularly scrumptious Wesleydale with apricots. All enhanced by a delicious white burgundy supplied by their wine club. 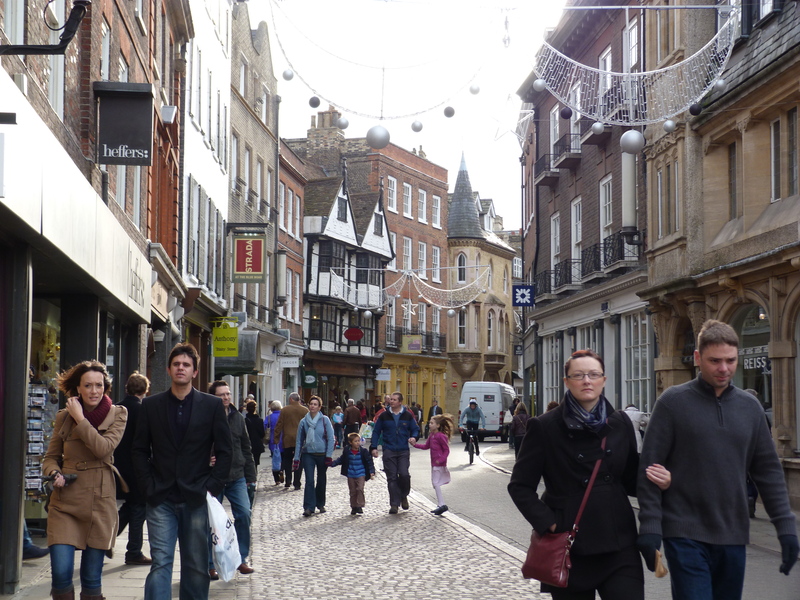 We may not be a part of the Cambridge “set”, but for one lovely afternoon, we were fully welcomed and at home there.